While reading the news today, an article about racial violence in Philadelphia caught our eye. Being captivated by news, we read a great number of articles in a variety of publications on a daily basis. Most of the news these days concern the political campaigning being carried out by members of both parties. But in our varied reading today we read about Dan Shechtman in Haifa, Israel, who won this year's Nobel Prize in chemistry for discovering quasicrystals. We read about the fate of women in Afghanistan once our forces are withdrawn. We also read about prostate cancer, pancreatic cancer, Steve Jobs' life and death, and Amanda Knox's release from an Italian Prison. What we did not expect to read was what suddenly caught our eyes, as we paused on the title of today's feature story. Race Riots? anything on the news, not read about it in our many journals. 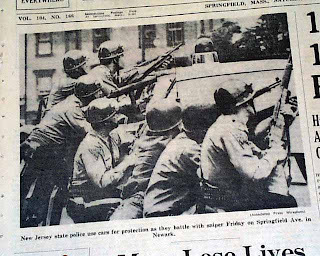 The term "race riots" brings back some truly unpleasant, frightening memories for us. In 1967, my sister stayed in Illinois to attend summer school at her university. I went home to work my summer job, and I lived through the Newark Race Riots. Can lightning strike twice? 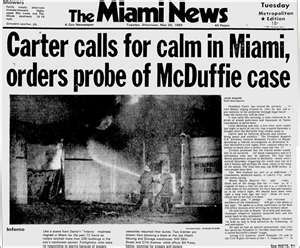 In 1980 we had the misfortune to be living in Dade County, Florida when race riots broke out in Miami, leaving 19 people dead. How does one justify the reason for a community to become so angry that they take to the streets and attack, kill, loot, burn and destroy property? One cannot! There is no excuse for violence and civil disobedience of that magnitude. In both instances, in both cities, the violence was sparked by incidents with police and black men. We won't delve into the reasons for them here, as they are easily found on the Internet. What does concern us is the disruption that race riots cause, the rift and rupture of peace in a community and the antagonism that they create between the races. 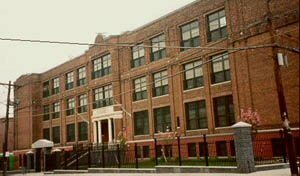 We were raised in Newark, N.J. We went to integrated schools, had black friends, black teachers, and although our world wasn't perfect we weren't really aware of that fact. It was post WWII, post Korean War. The world was at peace! In social studies classes we studied about discrimination in the southern states and we were shocked, such things never took place in Newark. We watched films about students attempting to integrate schools. We learned early the name of Dr. Martin Luther King. We felt pity for those poor people and when a new student arrived at our school from the south, we went out of our way to make them feel welcome. There was no Ku Klux Klan, no discrimination that we knew of. Those things happened in the south, and when you lived in Newark, the south was really far away. In 1963 we left Newark for the Midwest. In our little town of 1400 people, in central Illinois, there was one black man, Lemoyne Washington, and he was known and loved by all. He even worshipped at our church and was friends with everyone. Every summer we'd return to Newark to work. In 1966 I'd been hired as an elevator operator summer replacement at Hahne & Co. a large high end department store, and they'd promised I'd have a job when I returned in 1967. I'd just completed my Junior year in college in the summer of 1967. I was engaged to be married and my fiance was going in the Army after graduation. Most of my peers were concerned with the rapidly escalating war in Vietnam and the dreaded draft. Although there was a peaceful attempt led by Dr. King to achieve racial equality, racial unrest and racial disturbance were the farthest things from our minds. Again, we always believed that those things happened only in the south and it was seldom initiated by blacks. 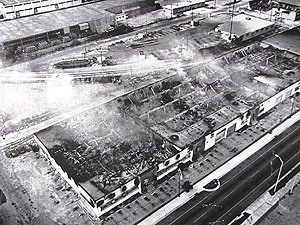 When the riots broke out in Newark, Broad St. where I worked looked like a war zone. It was a scene I hoped never to witness again. Then in 1980, living in the countryside south of Miami, we were married, and had school age children, when riots broke out again. Knowing how Newark had changed in the years since the riots, I was truly afraid. I'd recalled how in 1969 when I'd returned to Newark for a baby shower, I decided to visit Hahne's and I'd been accosted and nearly thrown off an escalator by a young black girl, merely because we'd both reached it at the same time. I was five months pregnant. 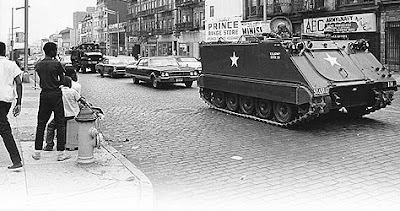 The city had changed and there was an aura of fear and intimidation. In 1982, we left Florida for Texas and have lived here ever since. My children are now grown adults with families of their own. Their friends are of mixed ethnic and racial backgrounds, and some include inter racial marriages. Our grandchildren too have racially and ethnically mixed friends. Discrimination is not something we teach or tolerate. It is beautiful to behold the harmony among these friends, and therefore it is disturbing to know that racial tension is once again rearing its very ugly head. When Barack Obama became president, I'd read enough about him to know that he had a Socialist ideology. A die hard Republican, I did not vote for him for president, I did however hope that his election would put to rest whatever recriminations were felt. A black president had been elected, something many thought could never happen. At first I thought that it had been a real boost to the black community. Did I imagine that blacks walked a little taller, were more confident than before, felt that now they really belonged? Was it my imagination? I suppose so, because it wasn't long before what became known as "the race card" went into play -- and it continues to be played and played all over again. "The President who promised to "bring us together" acts now to fan the flames of racial division. As every poll shows increasing disaffection among Obama 2008 voters, a desperate White House falls back on Alinsky 101—mobilize your supporters with a campaign of racial and class division and demonize, divide, and demoralize the opposition." Every time Al Sharpton, and Jesse Jackson stir up feelings of persecution and hatred between blacks and whites, it disturbs the balance between the races. When attorney General Eric Holder refused to punish the members of the New Black Panther Party for intimidating voters at the polling place, he incited racial grievance. When Representative Maxine Waters accuses the Tea Party of being racist and wants its member to be probed for "racist thoughts," what are impressionable black youths going to think? What sort of example did Maxine set for the black community when she told the Tea Party to "go straight to hell!" Before Obama's election, and with the great strides made in civil rights, we were of the belief that race riots were in our past. Mediation, laws, the courts, are available to stop discrimination. We have been recently reading about "flash mobs" in some major cities. We don't live in a major city and although we read about it in detail, it never "clicked" or hinted that the flash mobs maybe a precursor of things to come.
" You're going to see an American fall, "An American Autumn" just like we saw the "Arab Spring." You can see it right now with these young people on Wall Street. Hold on to your hats. We'll have the October Offensive to back the American Dream and to rescue America's middle class." Van Jones, is a black American, a communist, a Marxist, and he is going to rescue us? Rescue us from whom, what? No thank you! We don't need anyone inciting class division, racial division and hurtful riots on our behalf? Van Jones is a man filled with hatred. He was the leader and founder of STORM (Standing Together To Organize a Revolutionary Movement). He may hide behind the excuse of helping America's middle class in order to attract people to his movement, but Van Jones is motivated by racial hatred and he is promising violence. Are we going to allow a few malcontents to take us back to a past from whence we'd emerged a nation united? We have passed laws that protect people against hate crimes and discrimination. We are duty bound to identify this renewed racial violence for what it is. There is a need to open the lines of communication and to bring grievances out in the open. In a preemptive strike, we must stop calling them flash mobs, and have an open discussion about what it really is all about. Above all, we have to stop its spread and growth. We are a nation on the brink of failure, the last thing we need in a civil war. In order to overcome what ails us we need to all pull together, regardless of race or creed to save this great nation that our forefathers created for us. The wonderful gift these words promise us; "We hold these truths to be self-evident: That all men are created equal; that they are endowed by their Creator with certain unalienable rights; that among these are life, liberty, and the pursuit of happiness..." cannot have been written in vain. America is the most race conscious society in the world. We learn that every day from black caucuses, black teachers, black unions black ministers, black colleges, black high schools, black music, black moguls, black hair business owners, black employees, black art, black names, black poets, black inventors, and black soldiers. This problem is hundreds of times worse than we think. And hundreds of times harder to solve until we dare to call it by its rightful name. Another week in Philadelphia, another violent episode where people dare not speak its name: Race Riot. The latest is Port Richmond, where a mob of black people stormed a house, broke in, and beat up the occupants — all because of something that may or may not have happened to a black teenager on a bike. One of the attackers pulled a gun. Luckily the victim disarmed him. Later that day, another mob returned, this time armed with racial taunts and threats of violence against the white family if they testify in court. i had the same reaction. went out and read the book. got it on kindle. amazing: not just the riots. (300,000 black people rioting in miami every memorial day and we've never heard of it?? ?0 but the lengths people go to to deny them. amazing book. amazing writer.